When I started my journey of Insanely Tracking Everything™ lifestyle, I naturally took to using a glucose meter frequently. I would capture mornings when I wake up and evenings when going to bed. But I likewise tested meals regularly as well. Early on I happened to come across an article about the FDA insisting on tighter standards to be “+/-15% for home-use meters”. Wait… what??? A 15% margin up or down is considered the new, tighter range? Okay, that’s swell. But what if the one meter was off on its retests too? I decided to do some doubling up and got both an Accuchek and a Precision Xtra for some redundancy. Whenever the two were distant from each other, I’d do a retest with both. … riiiiiight. So on the second test the gap actually widens. Sure, I’d like to just expand the testing further, but this is already getting expensive as it is. 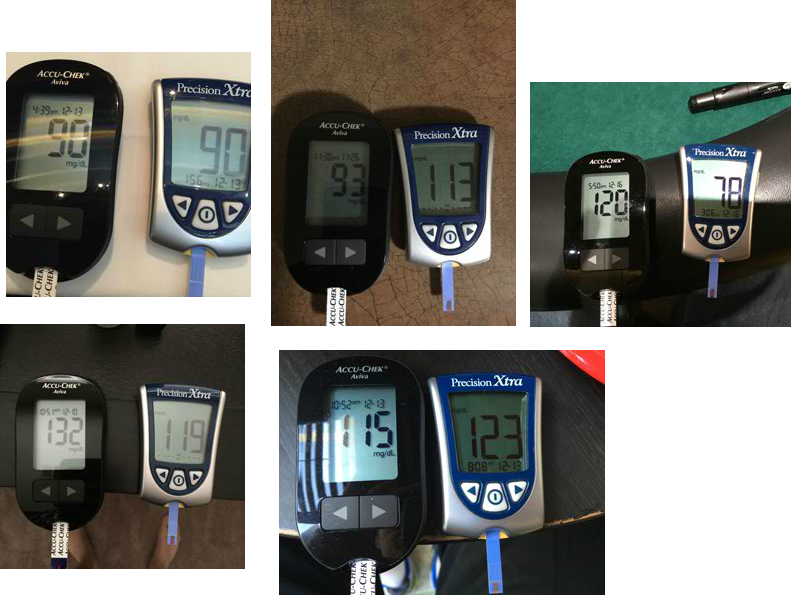 Here’s a loose collection of a few pictures from that time period where I was using both glucometers frequently. As you can see, the error range is pretty obvious given all of these were taken from the same site on my finger. 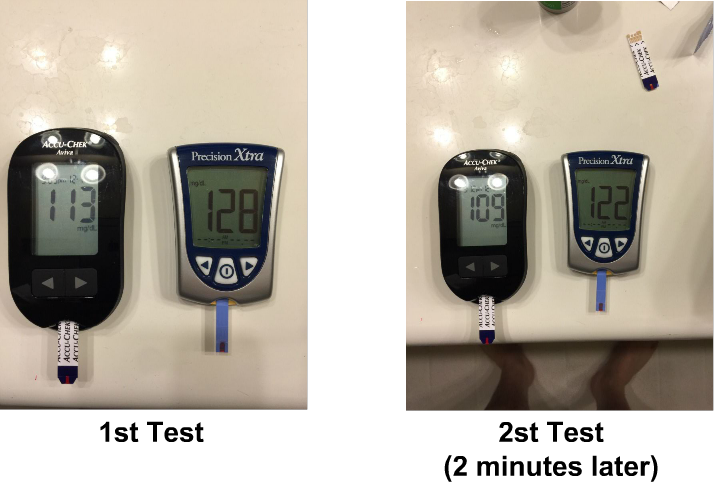 As you can imagine, I tried not to put too much stock into it past that point but continued to be sure I took measurements in the morning and evening anyway with my one remaining glucometer — the Precision Xtra. 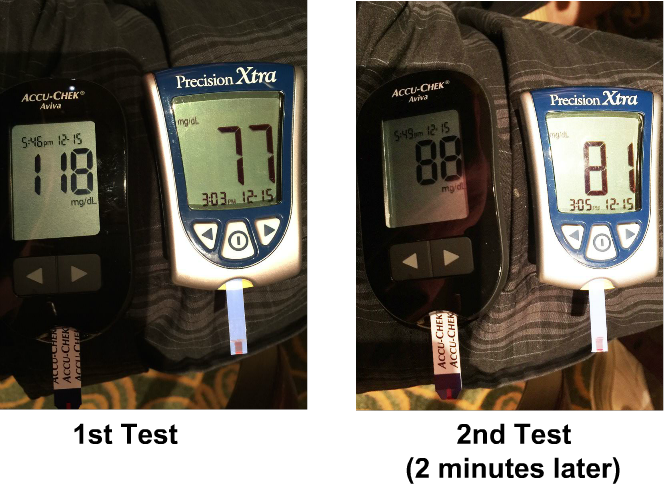 Not only do I already have some studies provided by the PTS Diagnostics people on the higher accuracy of their glucose component of their device, I also had a pretty obvious context… I was, after all, 14 hours fasted. 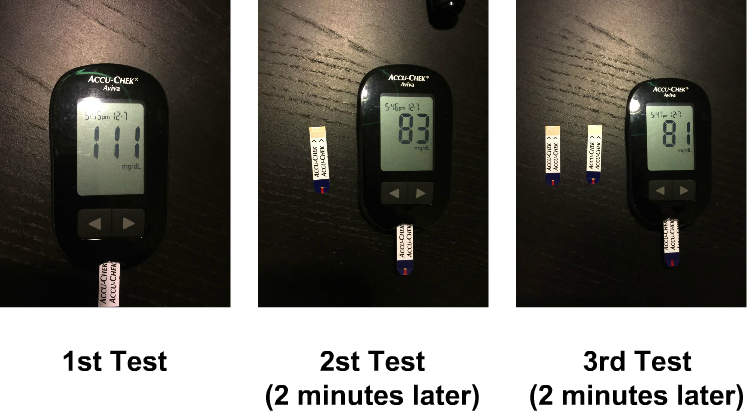 Which glucose reading makes more sense to you for someone on keto in a fasted state? Wow! Average difference was a whopping 16.36! And it was always higher, unlike the Accu-Chek from above. Again, remember this was from samples taken at the same time from the same site. Naturally, I felt somewhat betrayed by my Precision Xtra in this moment. Not only did I trust the CardioChek numbers more, but the numbers themselves seemed to make more sense. Given 12-14 hours of fasting, wouldn’t it be much more likely my range would be in the late 70s to mid-80s? 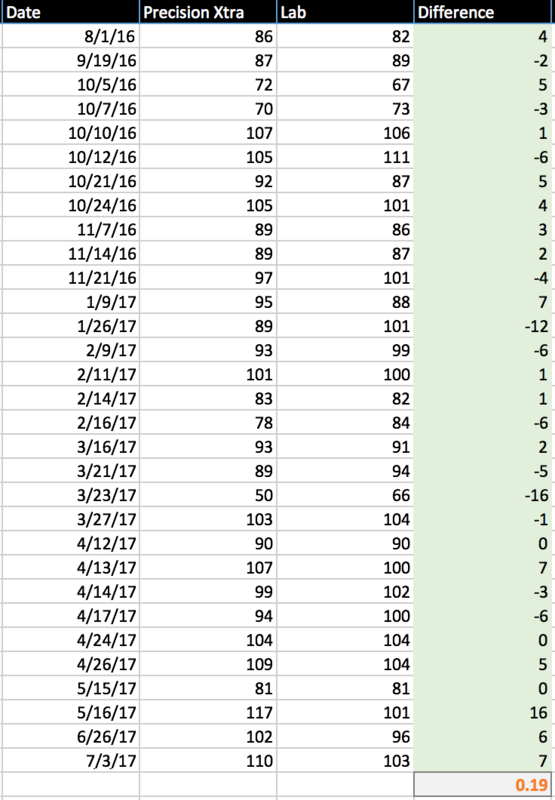 Side Note: The higher 100s fasting numbers from 4/13 to 4/26 were the Carb Swap experiment and its reproduction. Thus, if anything, these numbers were expected to be higher. Okay, so I had a solid five minutes of being genuinely awe struck. The 0.19 might as well be 0. Was the device really that accurate? 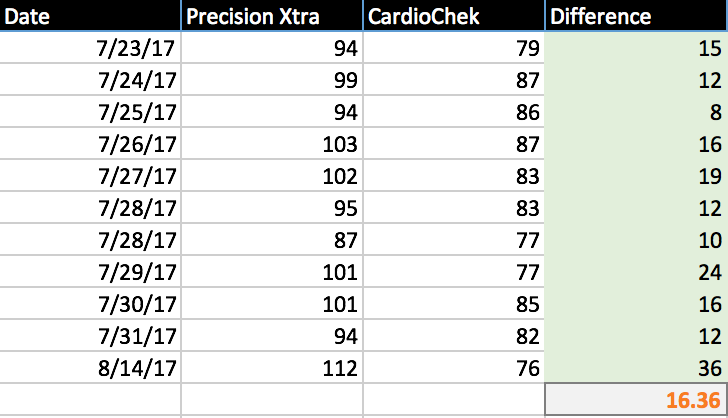 Sure, the deviation of the Precision Xtra vs the Lab Results wasn’t perfect, but certainly much tighter than it was with the CardioChek. Or to put it another way, was the CardioChek that inaccurate?!? … And then I remembered I was actually making a very different comparison between these two sets. 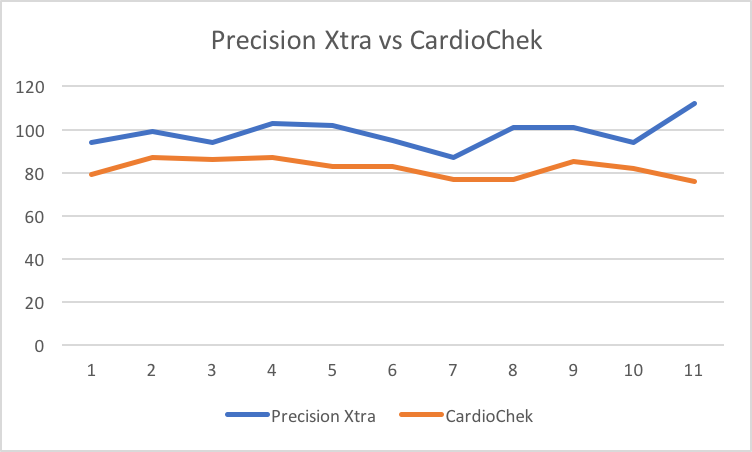 The Precision Xtra vs CardioChek was performed in seconds between each test. 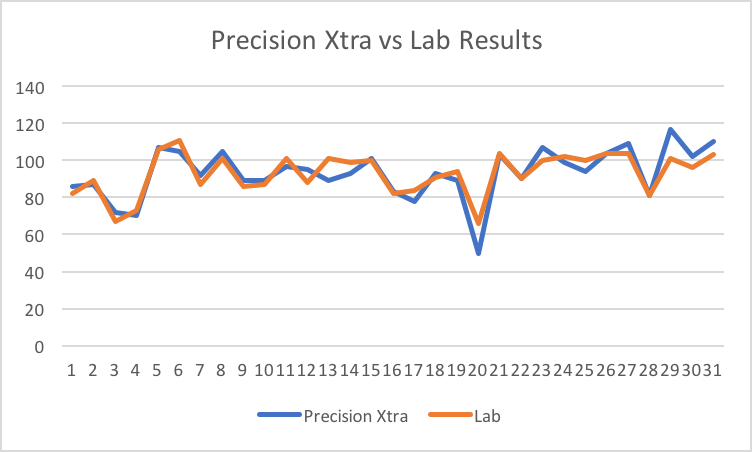 The Precision Xtra vs Lab Results was performed with 2 to 3 hours between each, along with lots of water consumed as well. The reason for this gap with #2 is that I always take my glucose first thing when I wake up (along with ketones, BP, etc). Since I try to time my fasting period around 14 hours each time I do a blood draw, that means I’ll likely have a gap in time until I can go to get the lab test. For example, I often eat at 6-6:30pm the night before, but wake up at 6am the next morning and thus wait until 8-8:30am before having my blood drawn. So with this in mind, it is indeed likely my glucose fell in this span of time between my morning Precision Xtra test and my visit to the phlebotomist. But boy, wouldn’t it be coincidental if that margin of difference just happened to fit so well with the outcome of the lab results! Naturally, this is where Scientist Me wants to have a lot of money to do all three tests at the same time from now on. Then I’d find out for sure who the odd man out was. Both fascinating and frustrating! Thanks for sharing this info so that people realize these monitors can vary greatly. If I had more available time, I’d love to record every single one I’ve done since Nov ’15 — but that would be quite a task! drink 2 liters over the course of a full day. I got that advice a long time ago as a solution to the fact my veins are very inset. Given I planned to get a whole lot of these tests (76 and counting), I knew I’d want to prepare as best as possible. i aways take BG when I’m at the lab because many things can change it on the way to lab (45 minutes away). Next time you have a blood draw, take your two or three meters to the lab and test there, using fingerstick not the blood they draw from a vein. Do three tests with each meter. Check to make sure the lab doesn’t let the blood sit around before testing as this can lower the reading. That’s my new plan. However, I’m now needing to be a bit tighter on the expenses, so I might not even be getting my blood draws as frequently either. Dr. Richard K.Bernstein isn’t up on ketogenic diets or LCHF, though what he in fact recommends is both a ketogenic and LCHF diet. He is a T1 diabetic, and his patients are both T1s and T2s. He recommends that diabetics keep very tight control of their blood sugars, in order to mimic the BG dynamics of healthy (not “normal”) people He recognized long ago that the FDA standards for glucometers were woefully inadequate, so he keeps abreast of changes to meters and strips and constantly. He was an engineer before later going to medical school. He tests virtually all the meters on the US market against the equipment in his office (I think it’s a Hemocue). If you go to his website you can always find out what meters and strips he recommends. This is huge. Most meters are worse than worthless. I use the Freedom Freestyle or Freestyle Lite. But I think he also approves the Bayer Contour. But bad data is worse than none. That’s good to know, Mike. I’ll check into his site for sure. And yes, I likewise subscribe to bad data being so much worse than none. This is why I don’t do as much reading with nutrition studies like I used to. But that’s a much bigger subject I’ll be presenting on soon. Am I the only one with a deranged system? I’ve been low carb for almost 4 years, with a lot of intermittent fasting, and I’m slowly transitioning to an all meat diet (when I don’t fast, that is). Here’s what happens when I eat a low carb diet (some salad, olives, the rest meat). This is the day before what I show above. I ate one meat at about 9 am, after 30+ hours of fasting. My lunch was “homemade chili (no tomatoes, only chicken stock, some onions), extra ground pork/beef; anchovies; sardines; carnitine (1/2tsp) and arginine (1/4tsp)”. I did not eat again until maybe 6pm. The only time I’m consistently below 80 is if I fast multiple days in a row, at least 3. 1 – If the fasting glucose appears to be fairly consistent (with in a +/- range of 5-7, for example) for the same time in the morning, then it is common for someone who is fit and leaner. This makes mechanistic sense as these bodies have a good reason to do more *glucose sparing*. And btw, that has happened to me — my fasting glucose was super low when I started keto, and slowly rose to this point with now a plateau at around 95-105 (but per this actual post, that might be inflated somewhat). I myself don’t really care if my fasting glucose were even 105 constantly so long as it was clearly consistent and appeared intentional on the part of my body. 2 – Conversely, if one is very insulin resistant and their fasting glucose bounces around quite a bit (93, 125, 101, 132), that certainly doesn’t appear to be controlled glucose sparing and is likely dysregulation with high insulin still very much in play. This has likewise proven consistent in labs of my friends and family. Wait till you get two different lipid testing devices! Seriously, you can test lipids with a hand-held device? That’s unreal. Yep — I plan to have my CardioChek with me every time I get my blood drawn now. Soon I’ll have a nice chunk of redundant data to compare… and even less blood left in my body. Heh! Yet another Pandora’s box you’ve opened. Those of us with our docs itching to prescribe statins are oh so thankful for your work and now … those of us with our docs itching to prescribe metformin and insulin because of Fasting Blood Sugars in the diabetes range, though prediabetic HbA1c, have new relief. My last 2 FBS: 144 and 140 mg/d. I’ve only now started with an Accu-chek Performa and already hit 147 after an apple, cheese and pecans, 152 after a chicken frankfurter, red peppers, onions and butter, etc. Many thanks, again, for so much work and stamina. Thanks SO much for your inspiring work on this and on lipids… truly fascinating and extremely relevant! You have probably seen this already, but it is worth explicitly flagging here for the sake of others who, like me, find these discussion threads a very additional valuable source of information. Basically a team of Israeli scientists discovered just how variable our digestive systems can be from each other. The main reason being the subtle differences in our microbiome – gut microbes. They claim to have gotten their analysis and algorithm to the point where they can predict the glycaemic effect of individual foods and even meals for different people. This short video explains all – I find it both fascinating and spooky… I can see a future where we basically feed all possible body metrics into ‘the system’ and it just tells us what to eat! I actually just saw a presentation on this at LCUSA San Francisco. Go figure! Here are 3 results taken at 7:28 am, 7:29 am & 7:31 am on a OneTouch VerioIQ: 152, 134, 113. As demonstrated in your post, it is very hard to capture consistent blood readings as it varies every few seconds and the mechanics of blood sugar control in our bodies is highly sophisticated. On top of it inaccuracy of blood meters makes things even worse. The best thing to read blood glucose so far is dexcom CGM even that only measures every 5 minutes or so and will miss spikes during this time, it also needs calibration regularly. I would not be surprised to see fasting BG of over 100 in someone who has been low carb long term. I plan to do some experiments with a CGM in the coming months myself. As an aside, those tests where I have both the Accu-Chek and Precision next to each other — they were done on the same blood droplet from the same site. So technically, this was the closest I could get to controlling for even small levels of deviation internal to the bloodstream itself. Hey Dave, Ever had experience with any CGM device? I was looking to get one but seems like they need a doctors prescription. Per the comment above, I’ll be using one myself. But it’s true, they are hard to get without a prescription. Several years ago I tested somewhere between 30 and 50 strips on my One Touch Ultra glucose meter. I used a calibrated glucose solution. It’s low cost and avoids other influences. As I recall the results were within about 5% of the average. My result refers to repeatability not to accuracy for which some standard has to be defined. However, on the few occasions that I checked my meter against a blood draw it has never differed by more than 3%. I conclude that my meter results are more than adequate for the blood tests I do. In the event I get an unexpected result I immediately repeat the test two or three more times and take an average. I may have to check out that device myself. That range of difference from the lab would be acceptable to be, for sure. Yes, I likewise retest a few times when getting an unexpected result. The problem is that there is any chance I could get an expected moderate response result on food that I thought was safe but the glucometer turned out to be in error on the low side. Less likely, but still possible. It is frustrating the inaccuracy of these monitors. I am just tracking my sugars. I cannot imagine what patients have to go through that use a sliding scale of insulin depending on results. I have the Precision Ultra and two OneTouch. The same drop of blood gave three different numbers. Not off by a little but off by a lot. I have a dog that is a type one diabetic. I think his monitor is more reliable than mine. You’re definitely right about that, Gela. If I were a T1D, I’d be several times more frustrated with the lack of accuracy for these devices. I’m curious whether the Keto Mojo kit promoted by Jimmy Moore on the Keto Talk discussion on his FB site has been tested for accuracy. I myself use the Precision Xtra…not sure if I want to invest or recommend a “new device” even though the cost (for now) may be more affordable. Have you reached out to Jimmy and discussed your research findings? Actually, I preordered Keto Mojo kit and once I get it, I will be testing it side by side with Precision (and maybe one more device) along with the blood draws. So hopefully from this, we’ll get some good information. Hi Dave, how did the keto mojo test work for you? I enjoy using it, if that’s what you mean. With these increases in Fasting BG that are occurring in some on a low carb diet, that I assume are Physiologic Insulin Resistance, and the great variability in Glucose Monitor readings, how does a low-carber with increasing Fasting BG know that he is managing his insulin sensitivity/resistance well. Is a Fasting Insulin the best test? There’s a certain degree of insulin resistance you can attribute to adaptive glucose sparing. This has happened with me, where my FBG was very low when I started, then slowly rose and has plateaued for the last year or so. But this makes sense in this context given my insulin has dropped to super low levels and my preferred fuel is now fatty acids. Can you expand on this point about adaptive glucose sparing? I only recently starting taking my FBG again after not having taken it for several years, since I started on a low-carb diet. I have been low carb since, and also am hyperresponder, athletic, lean mass, low insulin on my last test (2.7). Back in 2015 my FBG was in the 80s, now it appears to be closer to 100. So (assuming my meter is close at all) I’m trying understand why it would have increased over the past few years since I’ve been low-carb. I feel fine but want to make sure the increase is not something I need to be worried about. Thank you! In Canada our devices are within 10 percent and I have found bayer canada contour next to be very accurate for what its worth…..but for a t2d its the trend that’s important…. I have a few questions for you Dave. I have been on the ketogenic diet for 4 months, taking my fasting glucose every morning. My glucose reading is usually between 85 – 95, except a couple of times after sugar binges at parties the night before. Well, I just had” formal” lab work done, and not only was my glucose 104, my total cholesterol shot up to 400, LDL 297. Now I did stop taking statins a few months ago, but even 2 years ago when I wasn’t on statins my total cholesterol was maybe at 240, LDL 146 I have lost around 6 pounds since starting Keto a few months ago, so it isn’t as if the increase in LDL and total cholesterol could be from massive weight loss. I did listen to a few of your videos on YouTube, and understand that I can be somewhat reassured that my HDL (93) and triglycerides (92) are in a good range. So… I have two questions. 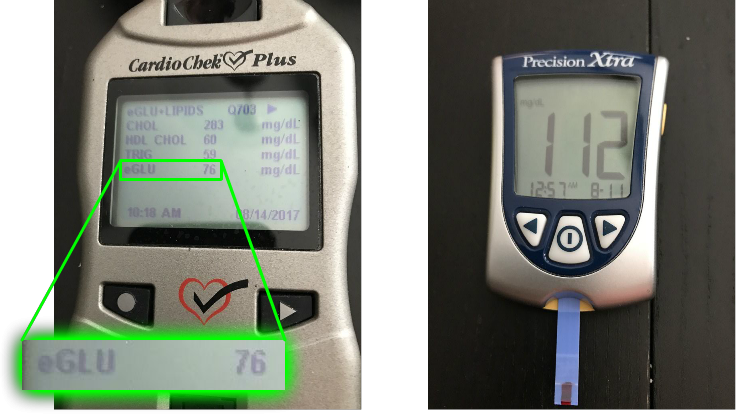 One is on the accuracy of the lab results for my glucose… I prefer to believe in the accuracy of daily keto mojo reading than the pre-diabetic reading of 104 from the lab. Next question: Why the hell did my cholesterol shoot up to 400? Would you be concerned if you were me? Going by your high HDL and high LDL and relatively low trigs, I suspect you might be a Lean Mass Hyper-responder &8 211; someone who is lean and/or active *and* powered by fat. If you were already relatively lean before starting keto, then that plus a small bit of weight loss could explain the spike in LDL. In order to understand why, you may find it helpful to watch Dave&8 217;s talk from Breckenridge 2017 where he explains it, if you haven&8 217;t seen it already. Essentially, you&8 217;re using VLDL to traffic fat-based energy to your cells, which could very well result in higher LDL and higher total cholesterol when switching to a high fat diet. You may also want to take a look at 8 on this list, where it shows that if looking at women with high HDL and low triglycerides, LDL didn&8 217;t actually appear to be very predictive for CVD risk. There are two more similar studies on this list too. Just something you may find interesting. Also, if you are active this could explain the slight spike in blood glucose &8 211; or it could be an error, or a transient shift for any number of reasons, etc. To rule random higher number, you may want to include markers like hba1c and fructosamine so you can see the larger trend going on. If I were in your shoes, I&8 217;d be happy to have those numbers, although I&8 217;d also want to check in on my insulin and hs-CRP to get a look at the over all picture, too, just to make sure everything was lining up to tell the same story.